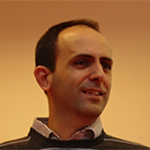 Michalis Vafopoulos is an affiliated researcher at the Software & Knowledge Engineering Laboratory (SKEL) of the Institute of Informatics & Telecommunications of the National Center for Scientific Research «Demokritos». His research and speeches are focused on Web economics and business, economic networks, linked open data, Web philosophy and Web literacy. In 2010 initiated PublicSpending.net which interconnects and analyses more than 1.5 trillion euros of global public expenditure. In 2011 published the monography “The Web Economy: Goods, Users, Models, and Policies” which serves as a textbook in postgraduate studies. The next year introduced “Being, Space, and Time on the Web” in WWW conference and the Metaphilosophy journal. In 2014 addressed the keynote in Web Economy Festival and in 2015 has been elected as a member of the Board in the Greek Free/Open Source Software Society and director of Open Data Institute Athens. He has written the bestselling book «Living with Web» (in Greek), which presents both the social and technical aspects of the Web as an integrated part of everyday life. Today, in the context of YourDataStories and BigDataEurope H2020 projects, he is working on the notion and engineering of Linked Open Economy as a top-level conceptualization that interlinks the major economic open data.